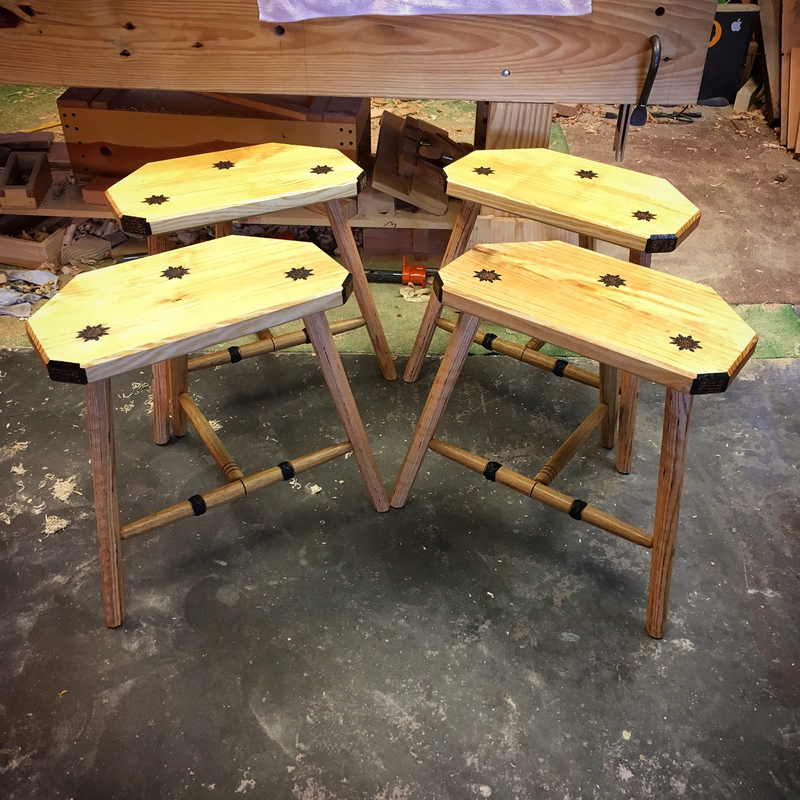 I assembled the remaining three stools and added the texture and wood burning as with the first. There were a couple of folks with questions regarding the order of assembly, so I thought I would go over that a little here. Add glue and assemble said undercarriage. 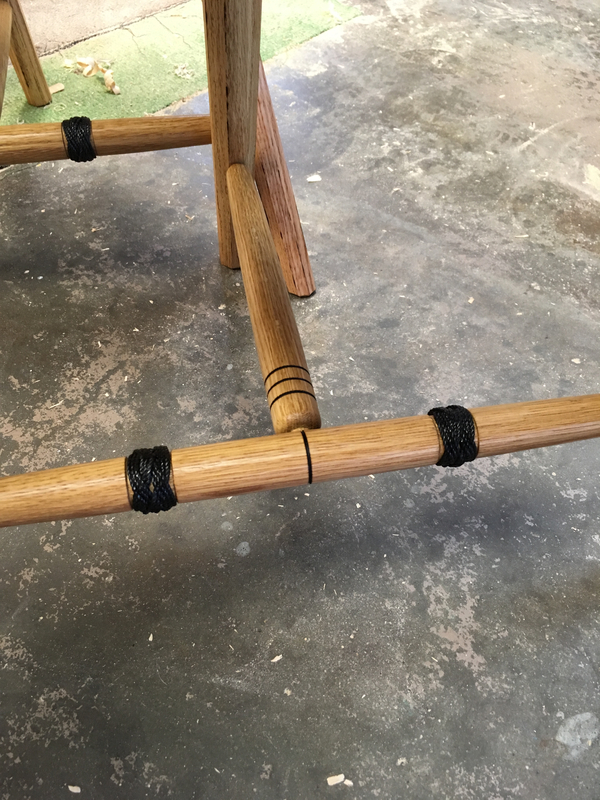 Apply glue to the seat mortises and leg tenons and install the undercarriage into the seat. There is enough “give” in the undercarriage to make starting the leg tenons into the underside of the seat possible. 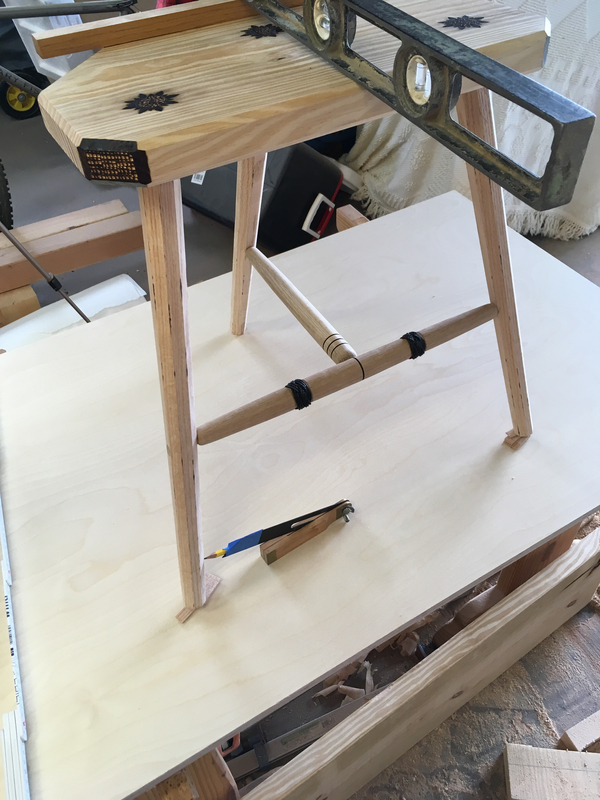 Once everything was seated, I wedged all of the joints. 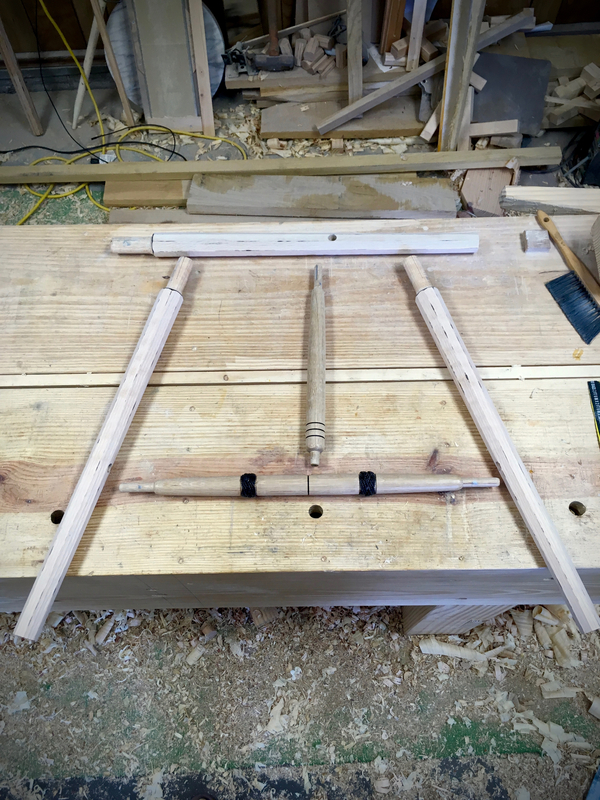 When the glue had cured, I trimmed and flushed the tenons. Each seat received a light uzukuri treatment. I wanted a tactile feel, but didn’t want to make the texture so deep as to create potential comfort issues. The seats now have a lightly worn feel to them. 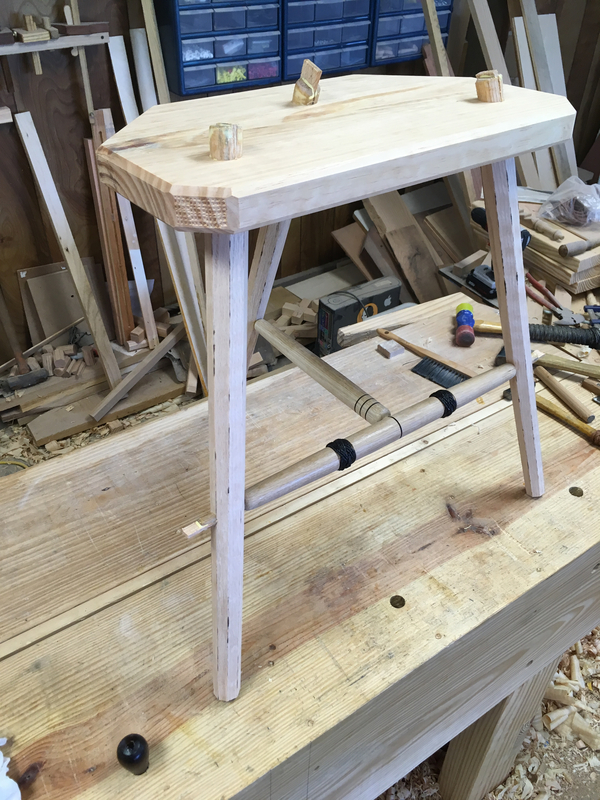 To trim the stools for final height I first created a level platform on which to work. The seats have a slight slope front to rear and I simply use a scrap of wood lined up with the rear of the seat for ease of consistency. Each stool was shimmed for level in each direction and the legs marked for trimming. A pencil taped to the blade of my bevel gauge (Peter Galbert-“Chairmaker’s Notebook“) is easily adjustable and perfect for this. All that remained was finishing. 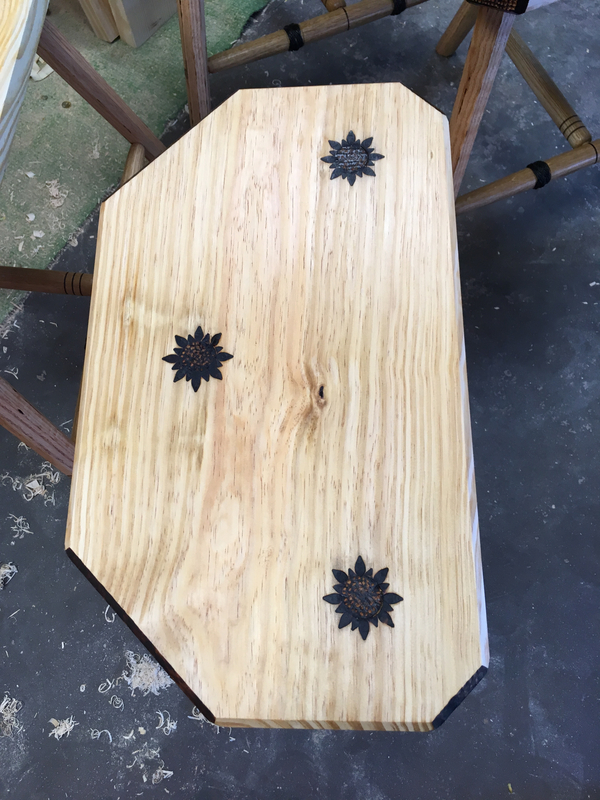 The finish consists of two coats of tinted linseed oil followed by two coats of Tied & True Original (linseed oil and beeswax). The first coat of tinted linseed oil really brings the stool to life. After a few days of oil and buffing, I have four completed stools. They are light, comfortable and sturdy. An impromptu poll finds that the height is “perfect” for the tables that they are intended for…management tested, management approved! 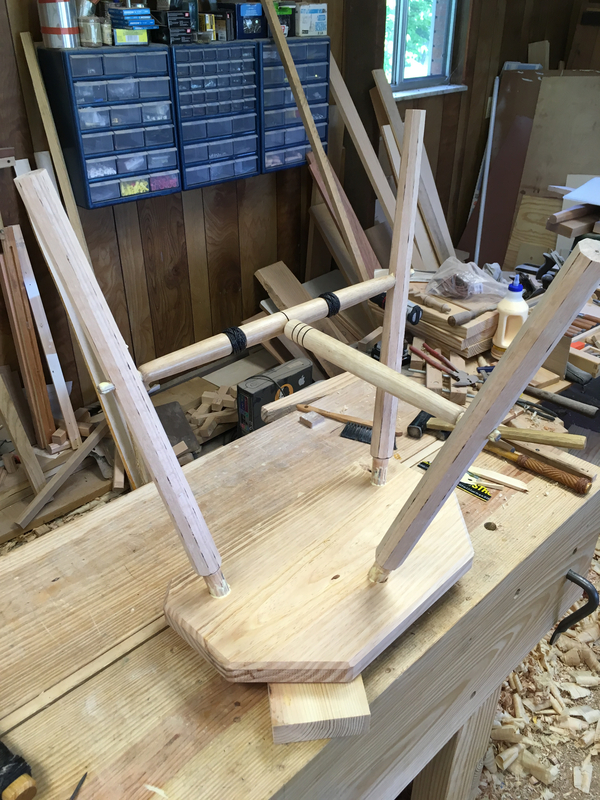 Next up…I continue with the crazy chair experiment and possibly a bench. 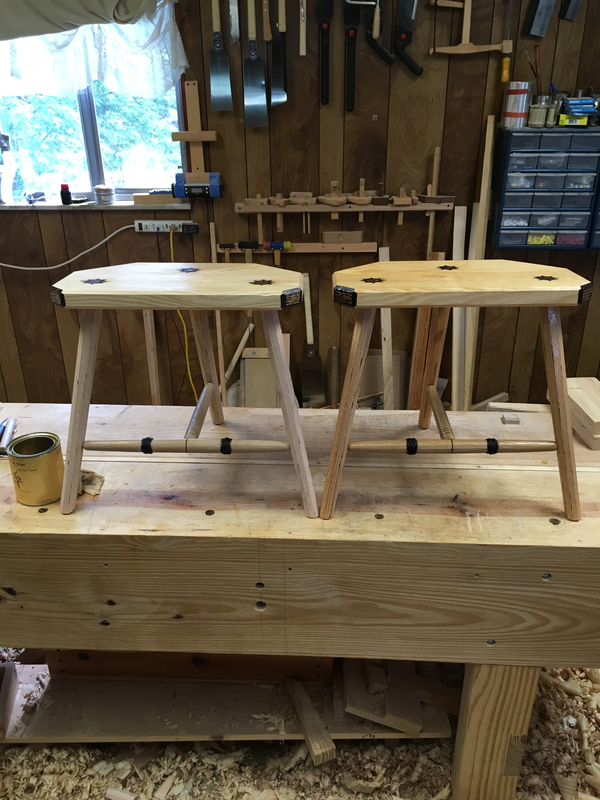 This entry was posted in Welsh 3-Legged Stool and tagged Tried and True, welsh stool. Bookmark the permalink. Ha…i often find that the simplest solutions are the hardest to come up with. I have a forehead slapping moment almost everyday. Very nice, Greg. Can you comment about the stability of the three-legged stool? No complaints from management, so … But maybe it’ll be a little different when you make chairs with backs. Looking forward to that. They are rock solid. Yes, it is possible to make one tip, but in actual use the chances are practically nil. The key is in the footprint of the legs. As long as the sitter’s center of gravity is within that footprint then there is no danger of tipping. If I get time, I may write up a post going into a little detail on the why and the how. Gorgeous. I have problems making sets of things, they tend not to look alike. 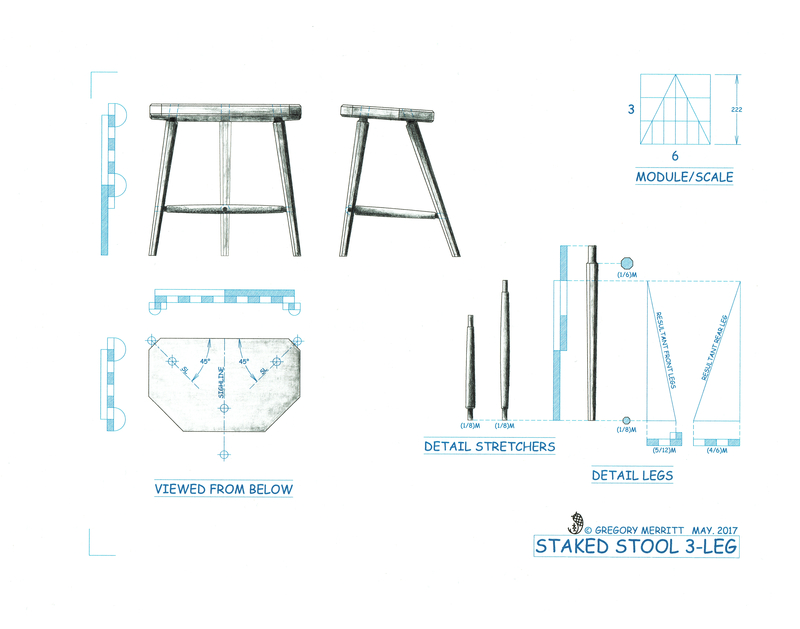 Your set of stools turned out just right. Thanks Brian. Sometimes I get lucky, sometimes not so much. I find I have better luck if I do each operation for each piece at the same time. In other words, all of the legs, then all of the seats…so forth and so on.